This verse has been the center of our marriage as we hit the storms. We all are going to have the difficult times... it just depends on how we are going deal with them. Hopefully sharing this will also show you to persevere and have patience with God's greater plan for your life. Through our pain there was a greater miracle that happened that we hold on to. August the 16th will be a day I will never forget. It was a Monday morning, Scott had been out of town for the week and was flying in around 1pm. I had been having lots of thoughts running through my head all weekend. My friend had called me that morning to come over for a play date before picking him up from the airport. We were doing the normal routine getting ready. I put on my favorite comfortable blue dress and it felt tight... "weird" I thought, and one of those thoughts went through my head. If you have ever been a person that struggles with infertility, then you understand how your mind just jumps to thinking... Could I be pregnant? Quickly I set it aside thinking I'm over reacting... I'm sure it's just that time of month. I then put on another outfit and again it was tight. I stopped and thought, boy I do have a lot of signs, when my sister in law was here visiting (She's pregnant) I felt her symptoms with her.... My mind was racing all weekend and I couldn't turn it off. I was looking in my makeup drawer when I saw an OLD, I mean old, pregnancy test from 3 years ago. So I thought just to stop this obsessing I'll just take it. I took it and I saw two faint pink lines slowly getting darker ..... "oh my gosh, OH MY GOSH" I kept saying over and over!!!! I started to cry but then I thought this can't be right, this test is so old it's no good .. I'm sure some thing's wrong.. it can't be! I was shaking like a leaf and yelled for the kids to finish getting dressed we need to run to the drug store. Brooke said "what's wrong Mommy?" .. I said nothing, but she knew something was up. We all piled into the car .. I was in shock .. that test just couldn't be right? WOW what if it is? Inside I was getting a little excited but didn't want to let myself get my hopes up. Then in CVS I bought a pack of three and took them all in the CVS bathroom with all 3 kids were in there .. touching who knows what but I was in shock.. Jonas kept looking at me with his big eyes wondering what are we doing? All three test slowly came up positive!! OH MY GOSH, OH MY GOSH!! tears streamed down my face... it's a miracle! OK I've got to get myself together I didn't want the kids to know what was up before I tell Scott! We walked up and down the aisles of CVS not knowing what I was doing but knew I needed to surprise Scott somehow at the airport. He's was not going to believe this! I just couldn't wipe the smile off my face I was walking on cloud nine... it really happened! I had dreamed of this day for so long. So, I found a card that sang "I'm so excited and I just can't hide it"... it was perfect and also got a small gift bag to put the positive test in. We headed straight for the airport over an hour early and completely forgot I was supposed to be meeting my friend. It was a mess for the next hour with parking and trying to find Scott's flight but finally we found him at baggage claim. They lost his bags but were on the next flight so we went to go eat at Macaroni Grill while we waited for the bags. I was a wreck inside and was dying to tell him! So we ordered our food and then I said we got you something at CVS. I gave him the card and he looked at me with a big smirk .. what? He then opened the bag and saw the positive test and said REALLY??? I said yes and his eyes filled with tears .. the kids were clueless:) I was shaking again and we hugged. I do think it was the shock of his LIFE but such an awesome miracle! We both couldn't stop smiling we were so happy! Thank you Lord for this is a gift! Three days later I started to have spotting and the doctor couldn't see me until the following Monday. Scott again had to go out of town that weekend and I was worried something was wrong. I felt different... I was worried but there was nothing I could do but wait... I trusted God he knew what is best. Monday came and our Dr. office sent us right over to the emergency room because I had been spotting. Scott and I were scared.. my heart sank. After an exam, blood work, an ultra sound, and 4 hours of waiting, no one could tell us anything. Finally the doctor told us my numbers were low and to return in two days to see if they are increasing. He did not seem very promising or hopefully. We were left stunned holding each other in the parking lot wondering what all this meant? It was just shocking after 7 years of not being able to get pregnant on our own why in the world would God take this child away? The tears wouldn't stop flowing. For the next few days it was a roller coaster ride. We had hope that they would increase but instead my numbers went down.... I was having a miscarriage. Within a really painful weekend I started to see HOPE. The holy spirit inside arise in my heart... I got pregnant on my own which was such a miracle!!! It's something we have prayed for and God answered our prayers after all these years, It was amazing. Something we didn't know could happen but God gave us HOPE that it could happen again. Even though it wasn't the outcome we wanted...we will always have a special place in our hearts for that child. We learned so much to trust the Lord even more, to lean on him even when we don't understand why something is happening. He has the greater plan! If I would have gotten pregnant before having Jonas I could possibly never have Jonas and we would be missing out on all the joy and love he brings! We couldn't imagine our life without him so I thank God for his timing. This baby was a miracle and gives hope to me as I hope it does for you! You see God is constantly working to transform us. Each circumstance we encounter is one more way for him to form us in his image and to rely on him more. When the storms come be thankful as he choose you to experience them and you will have a renewed faith each time you allow God to work through you. We need his help continually to keep our HOPE alive. We need to lean on him to help us to see difficulties in a more positive light. He will and always will give us strength to persevere. There are no limits to what God's great power and Glory can accomplish! He can change the most "hopeless" situation into the most beautiful miracle. I was left with this song .. it kept coming on the radio every time I was in the car .. 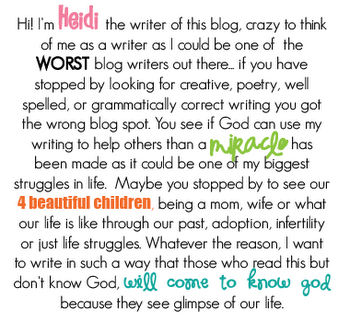 I know it was just another way God was there..
oh wow heidi...i was so excited with you...then i cried with you...thanks for sharing this story. and the to be continued is killing me! Oh Heidi, I am sorry. Thanks for sharing your sorrow and your HOPE. May you be filled with peace and hope this Christmas season! Heidi, Wow. I wasn't expecting this the be it at all. I am sitting hear crying jsut reading it. We've been through a miscarriage, being told I would never have bio kids, and then a surprise pregnancy. I can relate. There is HOPE. I always just have to remember that everything is in God's hands. The to be continued is KILLING me so hurry up and do another post... TODAY!!! Our prayers are with your family. 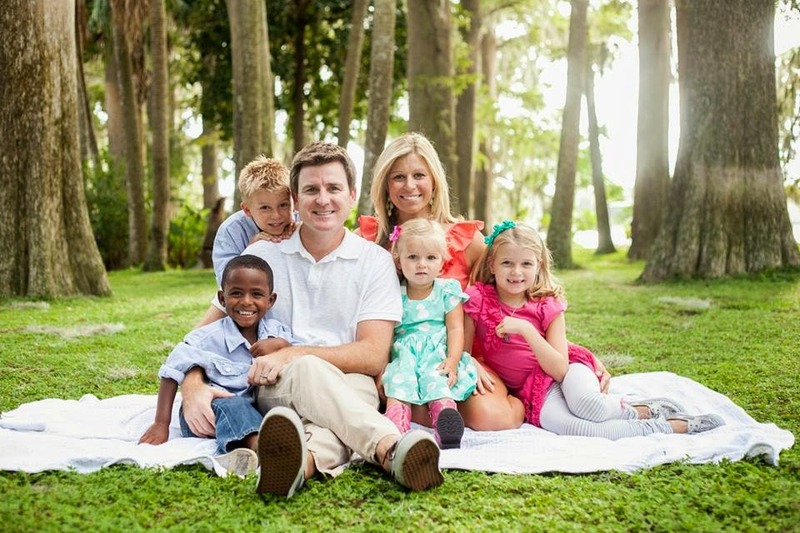 Thanks for sharing, Heidi, your stories, which reflect so beautifully our Father's heart for His children! And don't keep us in suspense! Hope... that word keeps coming up! Thank you for sharing your beautiful story. I am praying for you and can't wait to hear more! Thank you for sharing your journey. I love learning through you about strength, hope, and trust. You have a beautiful way of writing. God bless you - Merry Christmas.